Kids loved making these. Miss 4 picked them out at shopping and really enjoyed baking them with me. They were a favourite in my household. Perfect for a little girl (or boy)’s birthday party – to take to school for example. Great taste of white wings with cute little decorations. White Wings Sweetheart cupcakes are a very cute looking and delicious cake to make on a Sunday afternoon and then pop in the lunch box the next day! I buy these every time i bake just because no other very good priced cupcake mixes have satified as much as these have! They are delicious, everyone loves them. We take these to soccer, whip them in the oven and sell them in the canteen. All the kids love them and they sell very fast while still slightly warm. We don’t bother with the stuff on the top at soccer so I bring that part home and use it here. Very tasty and smell great. My 6yo loves making these and if lucky she won’t eat all the hearts before icing the baked cakes! 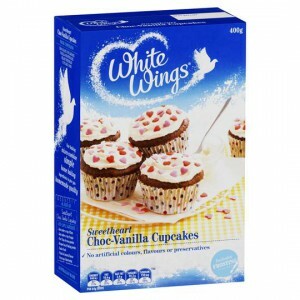 How would you rate White Wings Cupcake Mix Sweetheart Choc-vanilla?